Under each theme, there are videos, flashcards, audio recordings for pronunciation, and songs. A great way to spend time with your child is to go on my website and learn as a family. We play numerous games with our picture flashcards that can also be played at home. Have your child be the "el profesor/la profesora" (the teacher) and watch their leadership skills soar! For an extra bonus, make a sticker chart with your child to track your progress! Once each family member has earned all his/her stickers, your child will give you a "gift of time" as a reward (helping out with laundry, dishes, gardening, etc)! Third graders are woking on their DEPORTES: sports. Pitching, passing, kicking and catching, we're learning it all, from béisbol to baloncesto, from el esquí to la natación. We hope to finish off the year with a friendly soccer game, un partido de fútbol, all en español! Brush up on your vocabulary below, and get ready to play! Whether in Spain or South America, an increased Spanish soccervocabulary will help in every day Spanish conversation. Native Spanish speakers are often soccer fanatics. If visiting South America or Spain,it is almost a certainty that one will be engaged in a discussion with soccer as the theme. Here are the most important Spanish soccer words and phrases to help build a thorough Spanish soccer vocabulary. But, firstly, remember that soccer or football in Spanish is fútbol, and footballers are futbolistas. Here are the Spanish soccer words relevant to on-field positions.Remember that some word endings change depending on whether the subjectis male or female. For example, a male goalkeeper would be a portero while a female keeper would be a portera. Some positions also have more than one name in Spanish. • Winger – extremo. Easily remembered as a winger plays on the extremes of the pitch. • Forward – delantero. A centre forward is a delantero centro, while the attack in general is known as el ataque. The football game or match (el partido) is composed of the first half (primer tiempo), half time (medio tiempo or descanso, literally "rest") and the second half (segundo tiempo). Here are some more important Spanish soccer words to remember. • Corner kick – saque de esquina. The English word "corner" is often used in Spanish soccer vocabulary. Download the interrogative pronoun worksheet to practice your "question words" in Spanish. Here are some silly videos that will help students remember food vocabulary. 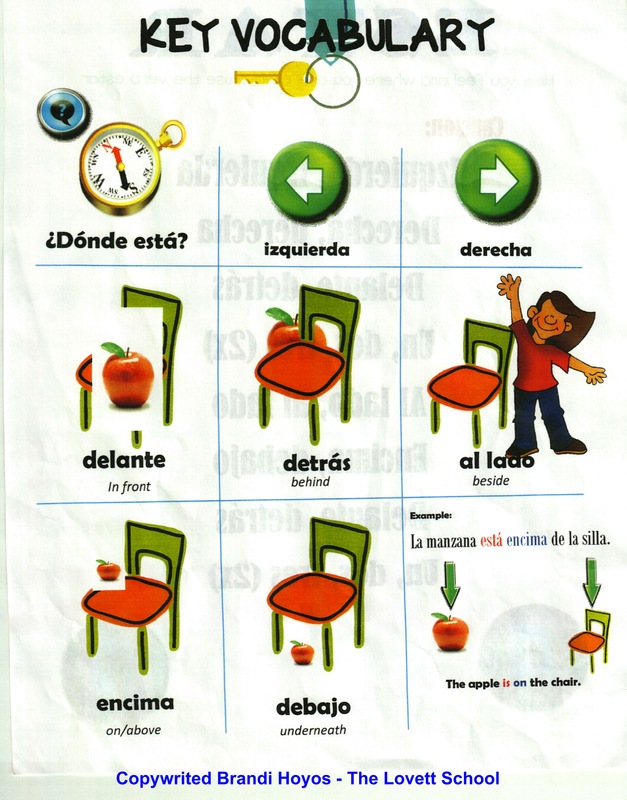 How do we use the verb, "estar" with various prepositions in Spanish? 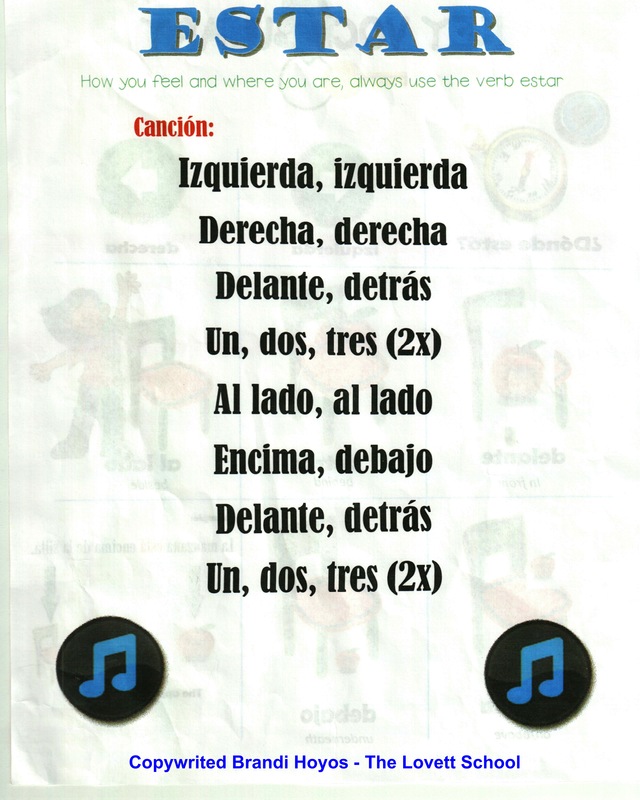 Students used both the Key Vocabulary and Estar Canción worksheets when learning how to apply the verb with Spanish prepositions. Then, students practiced what they learned using the ¿Dónde está? worksheet. Attached below is a blank Bingo board to practice vocabulary with your child. Have your child fill in the blank boxes with vocabulary words and play as a family!